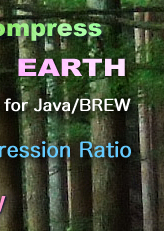 SophiaCompress(BREW) EARTH 6.0.3 Has Been Released. SophiaFramework UNIVERSE 5.3.0 Has Been Released. SophiaFramework UNIVERSE 5.2.0 Has Been Released. SophiaFramework UNIVERSE 5.1.12 Has Been Released. SophiaFramework UNIVERSE 5.1.11 Has Been Released. SophiaFramework UNIVERSE 5.1.10 Has Been Released. 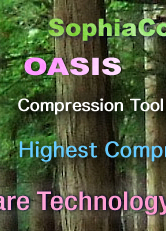 SophiaCompress(BREW) EARTH 6.0.2 with the plug-in function Has Been Released. SophiaFramework UNIVERSE 5.1.4 supporting YAGARTO 4.4.2 Has Been Released. 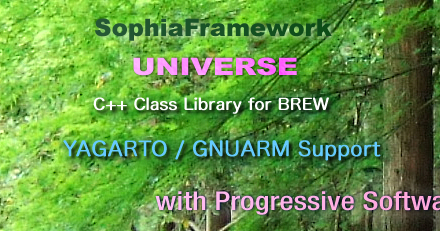 SophiaFramework UNIVERSE 5.1.3 with a New GUI Framework in ENGLISH Has Been Released. Sophia Cradle Upgrades BREW SDK Switching Tool with Support for " BREW Client 4-Series "